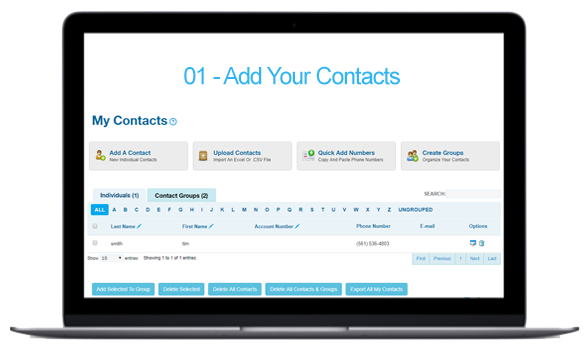 Quickly and easily send mass text messages to an entire list of phone numbers at once. Register a keyword to start building a customer opt-in list. DialMyCalls offers both long code and short code text messaging allowing the flexibility of sending message in which ever way works best for your organization. Sign up right now and try it completely free! Create engaging conversations via text message and use all the features that come bundled with our 2-way SMS platform such as longcode SMS, analytics, and much more! 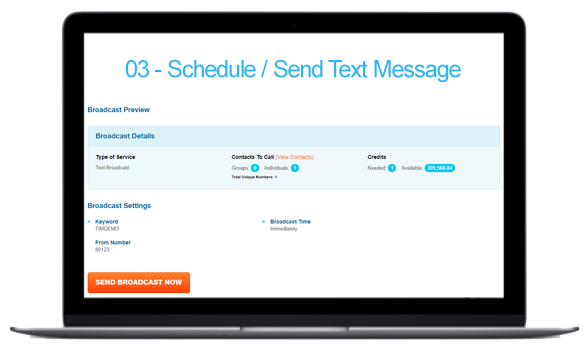 Whether or not your opt-in list has 5 contacts or 5,000, our SMS broadcasting service offers the ability to send bulk text messages quickly and effectively. Long Code SMS allows you to send a text message from a local 10-digit phone number of your choice, rather than having to use a short code and SMS keyword. All DialMyCalls accounts receive a demo SMS Keyword to utilize our SMS broadcasting service. Customers that purchase credits or a monthly plan will receive a free custom keyword. SMS Text Message Templates are now available! Customers can now send out a text message broadcast and select “Save As Template” to save the message in their account. 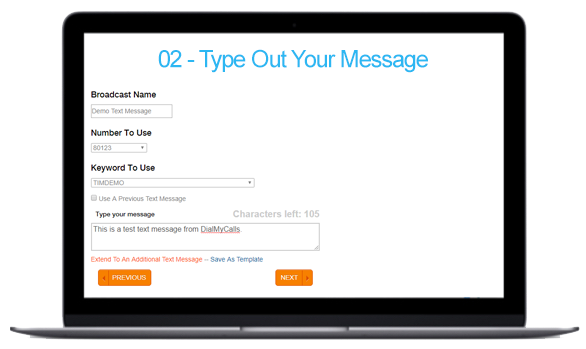 Use our keyword system to let people opt-in to your messages. If you already have a pre opted in list from another provider or list you can easily import or add your numbers. Type out the message you wish to be sent. You can even link together multiple messages to be sent one right after another. Send Or Schedule Your Text Message! Send it out right now, or schedule a specific date and time. After your broadcast is sent, you’ll have access to a detailed report with who received the messages and if they replied.